Praia D'el Rey Villas for golf Holidays. Silver Coast Apartments and Villas on or near Praia D'el Rey Golf Course. Praia D'el Rey Golf Course. Praia D'el Rey:- For golfing holidays in Portugal we know you will find Praia D'el Rey and the Silver Coast villa rental and Silver Coast apartment rental set in the surrounding countryside an ideal location for your Praia del Rey Apartment Rental or your Praia D'El Rey Villa golf holiday. For more details on Portugal Villa Rental, the area around Praia D'el Rey Golf and Country Club and the many places to visit click on Silver Coast (Costa da Prata). Praia D'el Rey Club has now been recognised as the finest example of a golf holiday development in Europe. The rolling surf of the world famous Peniche coastline borders the Praia D'el Rey Club, so golf is not the only sport here. Peniche is also one of the most important fishing ports in the country on the Cabo Carvoeiro. The nearby medieval town of Obidos is just 40 minutes from Lisbon making a Praia del Rey Villa Rental easily accessible. Praia del Rey Rental villas are in the concelho do Obidos (council district of Obidos). Obidos, a mediaeval walled town, once the gift of the Portuguese King to his Queen is a World Heritage site. The Castle is also a Pousada and you might consider eating a meal at it's renowned restaurant before returning home to your Silver Coast Villa. Your holiday in a Silver Coast rental will be enhanced by the good food and wine that the region offers. The Praia D'el Rey resort is over 500 acres of beautifully landscaped terrain, located in a region with numerous sites of outstanding historical interest. The cultural diversity, outstanding stretches of virtually empty sandy beaches, excellent restaurants, wines, and local gastronomy all beg for your experience before returning home to your North Portugal Villa. The Praia D'el Rey resort has as it's Atlantic border a two mile stretch of often completely empty beach. Forming the inland borders of the Praia D'el Rey resort are woodlands of pine and eucalyptus. Your Portugal Golf Holiday on or near Praia D'el Rey could well include long country walks, horse riding, and enjoyable bike rides if you've had enough of relaxing poolside in your North Portugal rental. Often visible from the beaches at the Marriott Praia D'el Rey Hotel are the Berlenga Islands, where is found at least one completely unique species of bird. The Berlengas are a world famous nature reserve, and your Praia D'el Rey holiday may also include the sport of diving, either there or on one of the organised boat trips from Peniche. For a Silver Coast Apartment or luxury Portugal villas for rent, the beautiful unspoilt environment around Praia D'el Rey, the world class golfing facilities of the Praia D'el Rey club, make sure you choose the Praia D'el Rey area for your North Portugal Villa Rental holiday. Looking for a Praia del Rey Apartment or holiday villa for a Praia d'el Rey golfing holiday in Portugal? Then please take a look at the websites, which are linked below. Villa apartments near Praia D'el Rey golf course. Villa near Praia D'el Rey golf course. 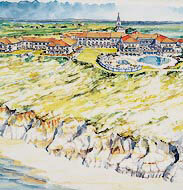 Marriott Praia D'el Rey Hotel Obidos: Book your stay at The Marriott Hotel, Praia D'el Rey, Portugal by clicking here. Looking for property management on Praia d'el Rey? Ennis, Property Management, Silver Coast, Portugal. of holidays, villas and travel resources.